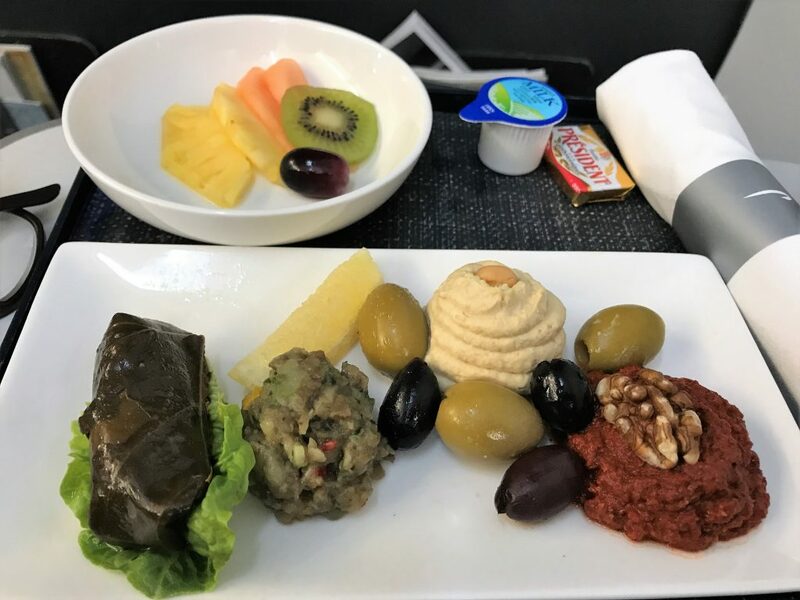 Whilst I have been waiting for my gallbladder operation that I had Wednesday, I have had to be careful about what I ate which led me onto trying some of the special meals available on British Airways. I was slightly surprised by a couple of negative comments when I posted about ordering special meals recently on social media. 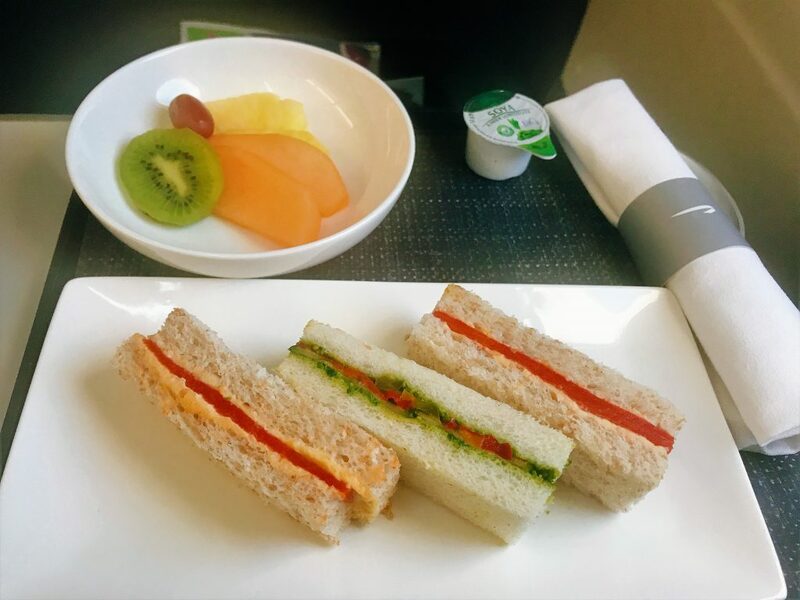 Many regular flyers order special meals to break the monotony of the Club Europe meals since they aren’t rotated that regularly and the lounge food is also pretty samey after a while. Whilst, yes, you could survive by eating before or after your flight, you have paid for a meal in Club Europe. If you want to try a special meal there is no difference between that and pre-ordering a main course in Club World. It is free for anyone to do it whether you actually have that dietary requirement or not. I will look at what I received as special meals over the last couple of months. One thing to note is that often special meals will be the same across a number of dietary requirements so don’t be surprised if you get the same meal even if ordering different meals. 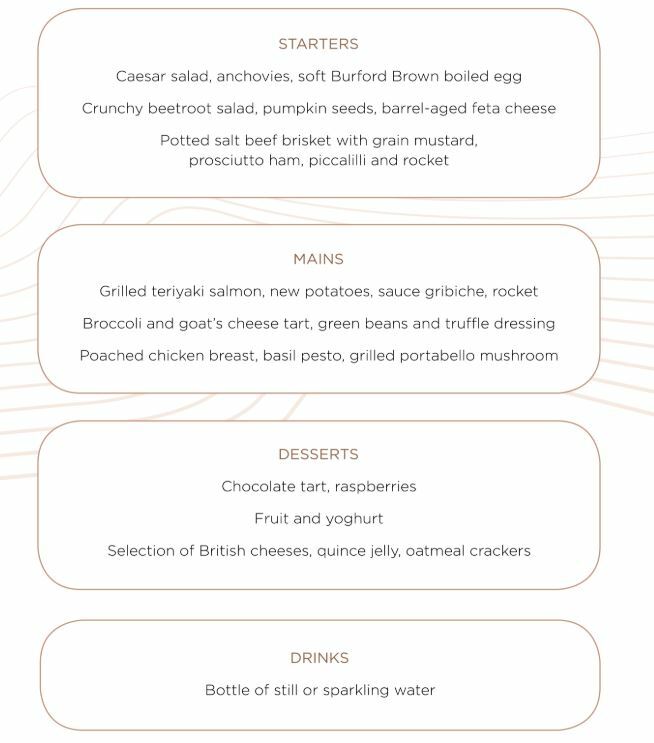 The meals are also different between Gatwick and Heathrow and change far less regularly than the regular Club Europe meals. 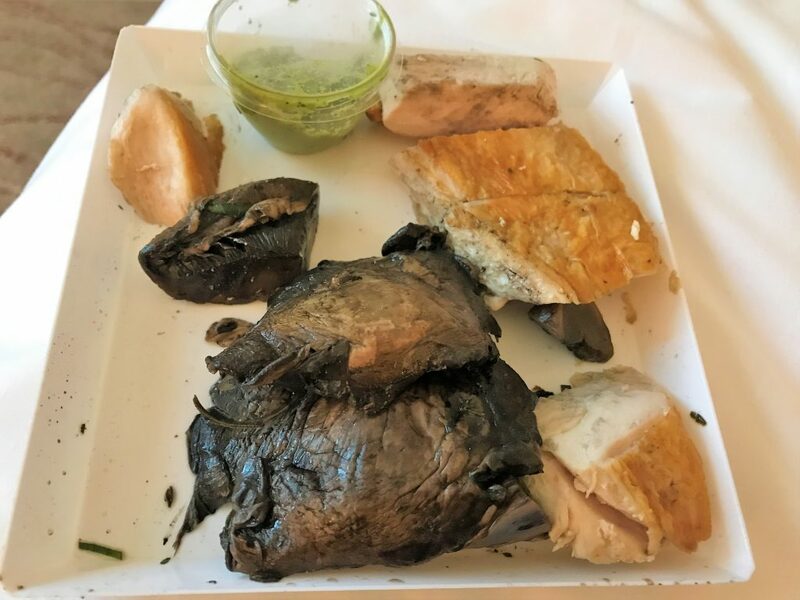 I would say if you are trying to stick to a healthy diet it is well worth considering as the standard Club Europe fare is not exactly fat-free! Do not adjust your computer – the broccoli and beans were actually that rather blackish colour and didn’t taste any better than they looked! The vegetables were absolutely obliterated by overcooking but to be fair the rest of the meal was actually very tasty. The chicken was in a light white wine type sauce with leeks and the potatoes had herbs on them. The starter was fresh and light and the dessert whilst a little unimaginative tasted good. If they got the vegetables right I would actually order this in preference to the usual meals sometimes. On the shorter routes, I am not a fan at all of the paninis and the salads are usually very small. I actually really enjoyed my alternatives and would order these again. My favourite was the Asian vegetarian although my advice is to make sure you take plenty of bread from the basket for dipping. Afternoon tea is served 14.00 – 16.59 on short and medium routes and is usually 3 cold finger sandwiches or a ploughman’s salad (meat, scotch egg and cheese selection with bloomer bread) with cake. This was the vegan version which was hummus and red pepper or pesto and vegetable finger sandwiches. This was very tasty compared to the usual sandwiches but rather insubstantial if you wanted a proper meal. I prefer the ploughman’s salad from the regular menu. I ordered Asian vegetarian for the regular meal service on a short or medium route and was very pleased with the dish. With bread, it was pretty substantial and the dips were all delicious. There was hummus, a spicy red pepper dip and an aubergine based dip with vegetables. 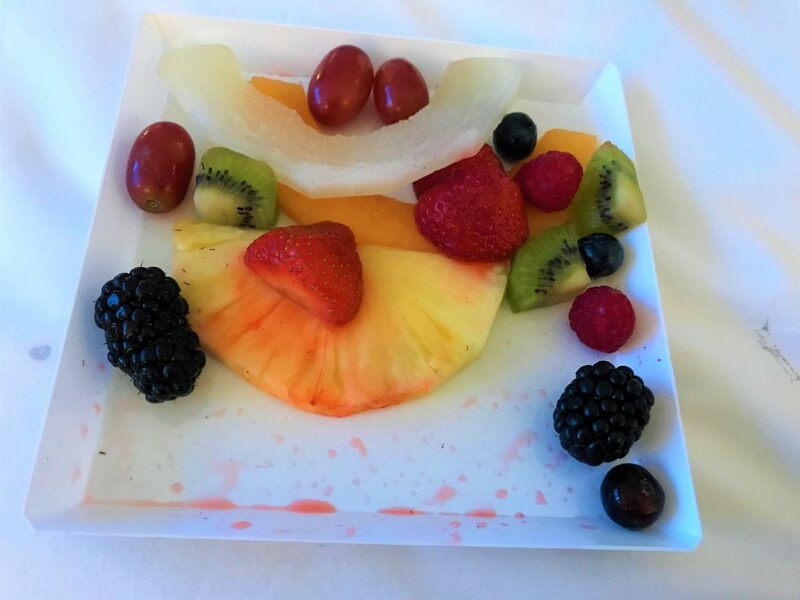 I thought the fruit salad was a bit stingy though! The final meal I can’t remember if the final meal I tried was Vegan or Vegetarian but I am guessing at Vegan given the non-dairy creamer on the tray. 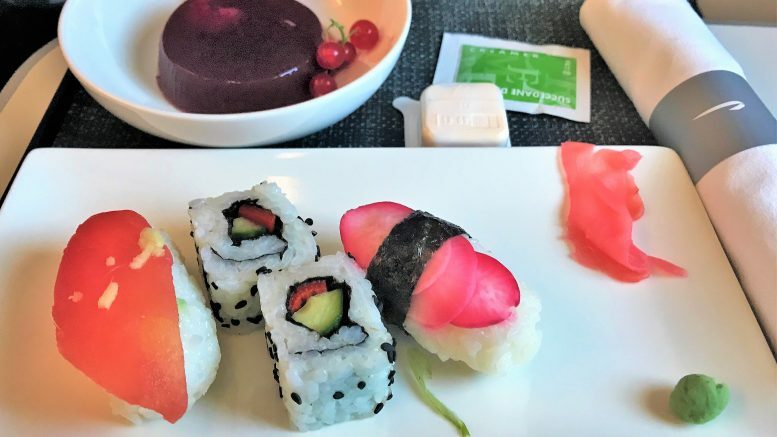 They do, however, also serve the sushi for vegetarians either as a starter on long routes or the main meal on short and medium. Although there is jelly it was cloudy which suggests it was made with agar. Overall this was lovely fresh and zingy meal with the wasabi and fruit jelly that I would happily have again. Although the sushi looks like fish it is actually tomato on the left! You can read more about BA Club Europe meals and the times they are served here. If you are travelling economy and want something a bit nicer than a sandwich there are several options for food to go at Heathrow. As well as the usual high street takeaways such as Itsu and Boots there are also several upmarket options. One is the Fortnum and Mason Hamperlings which Roving Reporter reviewed here. 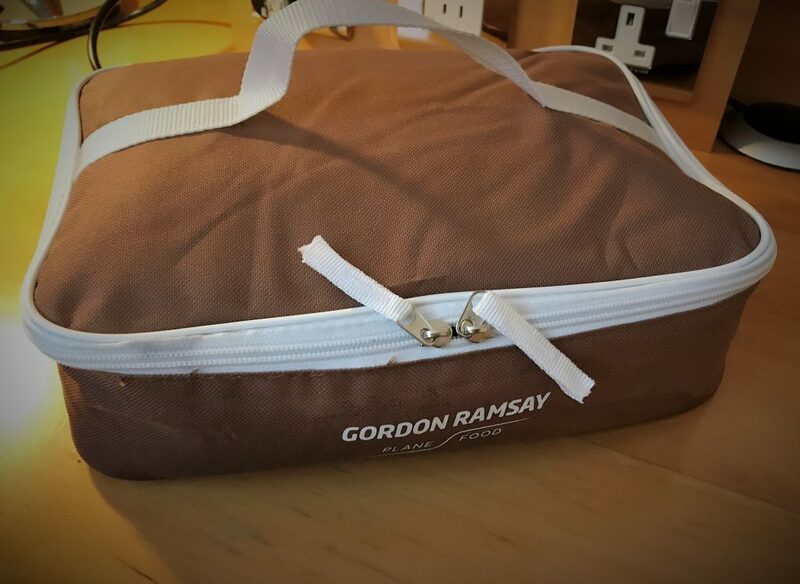 The other is Gordon Ramsay’s Plane Food picnics. I had always been a fan of these but after the refurbishment of Plane Food they changed the options and format of the picnics so I thought it was worth a second look. Now in store, it appears to be set menus although you can actually mix and match. Personally, I much prefer the mix and match option. This took a few minutes to make up the box. On opening the cool bag, I’ll be honest and say it did not look very appetizing, particularly the chicken main. The food before was definitely more visually appealing. Although I had kept the bag flat the whole time the contents had still ended up getting a bit shaken. I started with the Caesar salad. Although it looked the best, this was a bit disappointing. I am assuming it had been made up sometime before as the croutons were completely soggy and soft which to me are one of the most important elements of the dish. 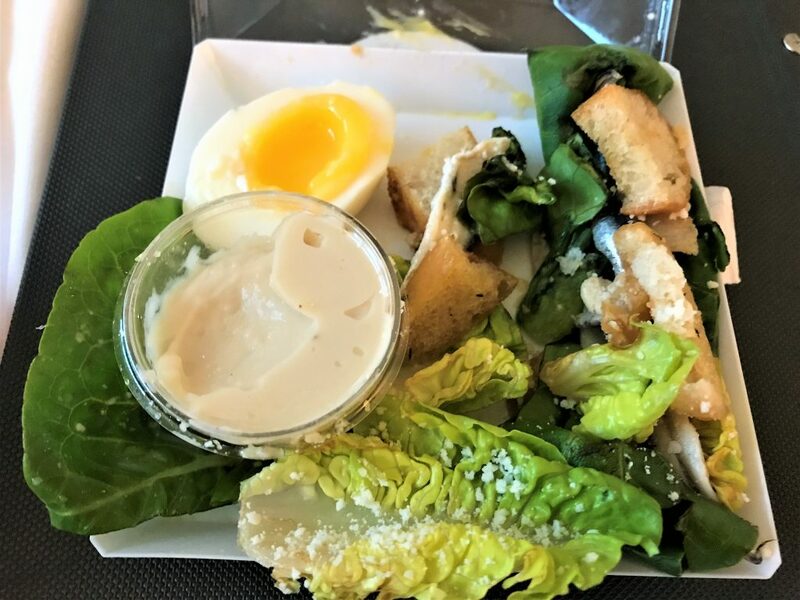 The dressing, whilst tasty, was far, far too thick to actually dress the salad properly, particularly when travelling. It was more like a mayonnaise than a dressing. The egg was perfectly cooked though. Fortunately, this tasted a lot better than it looked! The chicken was tender and had a nice flavour and I enjoyed the meaty mushrooms. There was a nice taste of herbs in the dish plus a pesto dressing. The fruit was pretty simple but was good quality apart from being a bit shaken up! However, the accompanying yoghurt appeared to be missing. You can also get other items to take away from the grab and go. I was a bit disappointed compared to what I had sampled before from Plane Food. There could have been more choices but I also felt that the menu was less interesting than before as well. I would probably go to Fortnums or somewhere like Itsu next time I want an on-board picnic. You can find more information on Plane Food here. 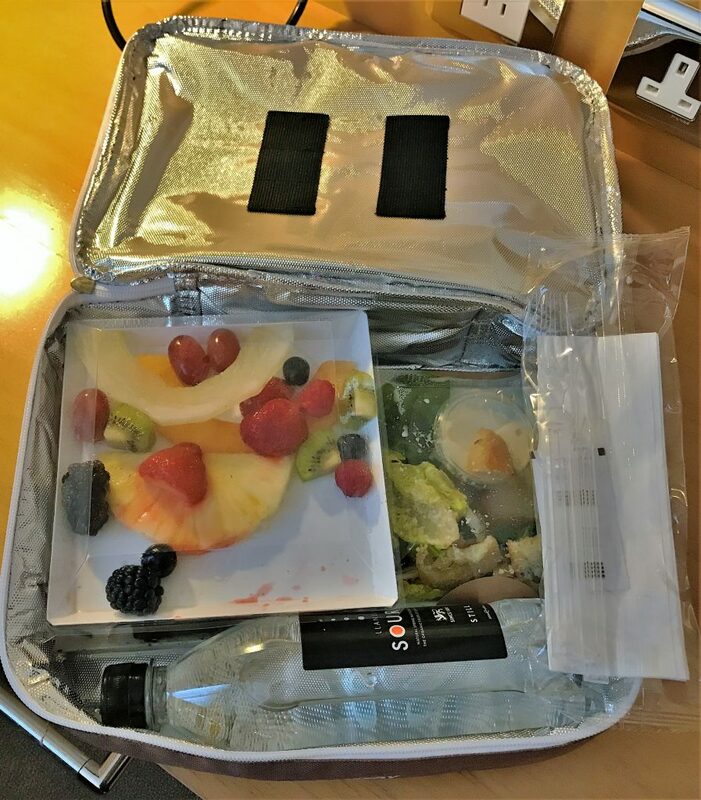 2 Comments on "British Airways Club Europe meal options and Plane Food picnics review"
I’ve only had the long CE service twice but was quite impressed, though the way it’s handled by the crew makes a lot of difference. I think I read somewhere that BA were trialling the ‘long’ service on some ‘medium’ routes as there have been complaints that these suffered following the changes. Have you heard anything on this? Hi Chris. Yes it is certainly now the long service on Madrid which I will be reviewing next week. 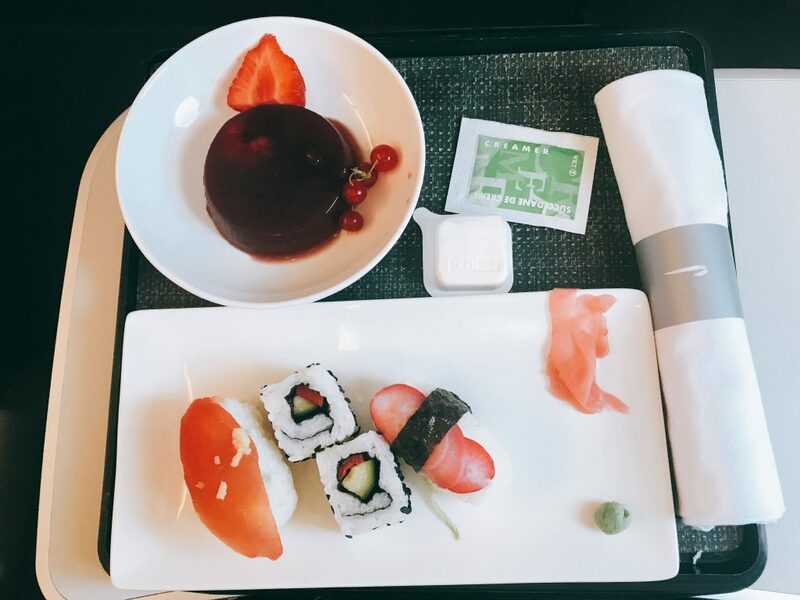 I believe that this is precursor to the September Club Europe changes which are rumoured to include making the medium route food better (as they need to ).